Visit Comply's Website to find out which model fits your earphone. Sit back, relax, and enjoy your music without distraction. Comply™ Foam offers a wide variety of premium earphone tip replacements for whatever your musical desire is: We offer eartips that will withstand your most rigorous sport as well as ones that enable you to listen all day long. If blocking out the world is more your thing, though, let us introduce you to Comply Foam’s Isolation 200 series. Isolation Series earbud replacements are the result of intensive ear canal research and a passion for protecting (and enhancing) hearing. The ear canal isn’t a static body part. It flexes, moves and changes size and shape as the rest of your body heats up, cools down and moves. While Comply’s patented technology was first used for audiology products, it is now taking the world of consumer electronics by storm. More than 75 brands choose Comply earphone tips as their solution for ultimate listening, so what are you waiting for? Get on board ad start listening to music how it’s supposed to sound: Find your fit now. 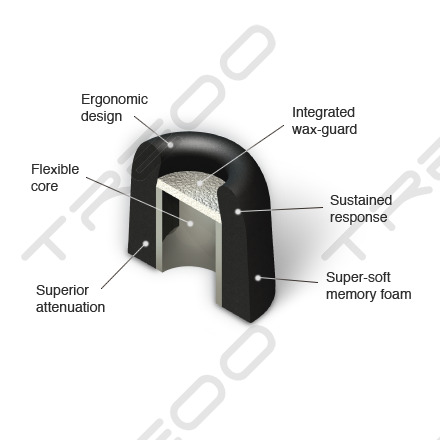 Ultra-soft Memory Foam: Comply Isolation Series tips are made out of patented viscoelastic memory foam right in the U.S. By being an astounding 30 times softer than standard silicone rubber earphone tips, your ears won’t be plagued by achy listening fatigue. Instead you’ll be able to listen to your entire music library without hoping for a tiny ear massage afterwards. WaxGuard Protection for Clean Soundports: Available with our Isolation Tx-200 Series earbud tips, Comply’s WaxGuard protection is highly recommended for use with high-end earphones. The last thing you want with an especially expensive pair of earphones is earwax and debris to clutter the finely tuned soundport. WaxGuard is an acoustically transparent filter integrated in Tx-Series eartips that ensures a clean and clear sound every time. Superior In-ear Fit: Silicone rubber earbuds are thin, flimsy and unforgiving. Most come as one-size-fits all, and if there’s one thing we know it’s that no two ear canals are the same. 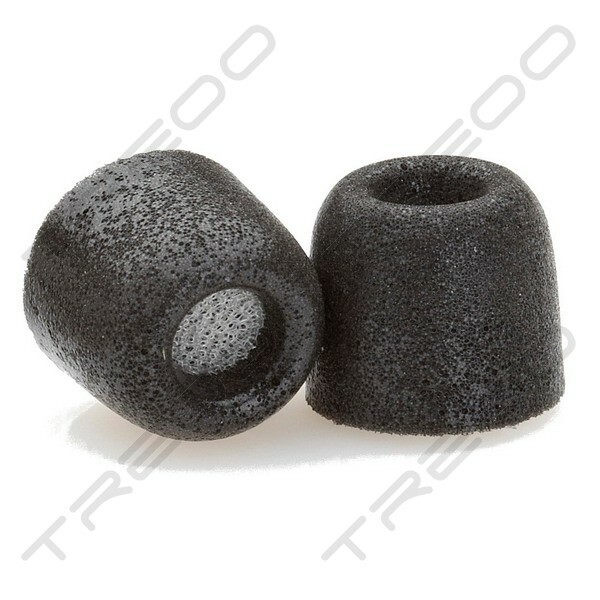 Comply Foam offers 100% better grip than rubber earbuds. Thanks to the extreme adaptability of the memory foam, superior attenuation and a flexible core, Isolation 200 earbuds are designed to create the perfect seal with your specific ear canal. So jump, move, sweat and swing—those buds aren’t going anywhere. Audio Experience Unlike any Other: The cleverly designed shape of the Isolation 200 Series Foam Tips means that sound is directly funneled into your ear. Don’t stress missing a beat ever again. Maximum Noise Isolation: With a focus on a complete seal of the ear canal, you’ll experience sound isolation at its finest. The thick memory foam provides two times more decibel reduction than silicone tips, meaning external sound is no match now. Without the infiltration of ambient noise, your music will truly shine as low basses and high notes are finally able to cut through the clutter. Popular earphone brands compatible with 200 series earbuds include Klipsch, Westone, Etymotic Research and AudioFly. These brands produce some of the highest-quality audio tech available—why compromise high-fidelity sound with shoddy eartips? Stop leaking sound and start locking it in. Hear the music for what it’s worth and get the most out of your finely tuned earphones. 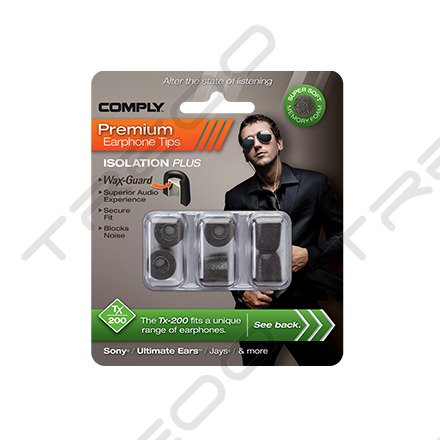 When you’ve had enough of the outside world cluttering your music-listening experience, it’s time for Comply’s Isolation T-200 or Tx-200 Series earphone tip replacements. Available in three sizes and several sleek colors, you’re destined to find the perfect earbud for you. Chat with us today to have any questions answered. It’s time to start hearing music like never before.